Toasted walnuts, peppery arugula, and creamy goat cheese mingle with crisp bacon and apples—this salad hits every flavor note! Fry bacon until crisp, then drain off most of fat. Add maple syrup and brown sugar to pan, cook and stir until bacon is well coated with melted sugar. Remove from pan onto parchment paper. 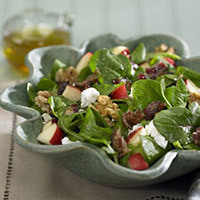 Combine apples, walnuts, goat cheese ,and arugula in a large bowl. Whisk together dressing ingredients and toss with salad. Garnish with bacon.